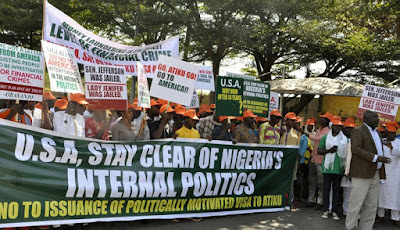 Protesters, under the aegis of the Forum of Non-Governmental Organisations in Nigeria, yesterday stormed the United States (U.S.) Embassy in Abuja. They urged American government to deny former Vice President Atiku Abubakar visa to the US. The group alleged that Atiku, who is the PDP candidate in next year’s presidential election, was allegedly involved in a bribery scandal for which Senator William Jefferson was tried and jailed for 13 years in 2009. The group’s convener, Wole Badmus, said: “Grantinghis (Atiku’s) visa request will amount to a negation of the Patriot Act which makes the acceptance of foreign corruption proceeds a US money laundering offence. “It also makes a mockery of the United Nations (UN) Convention Against Corruption enacted in 2003 in which the U.S. played an active role in its enactment and presently ratified by over 40 countries. “It is also against the spirit of investigative group dedicated to combating foreign corruption by Politically Exposed Persons (PEPs) formed in 2003 by the U.S. Immigration and Customs Enforcement (ICE). Atiku’s team said they are paid protesters and deserves no attention. 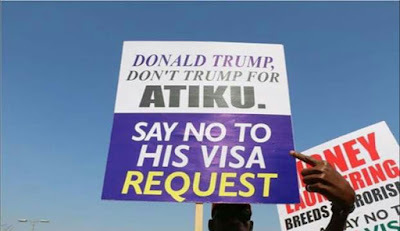 Hey Buddy!, I found this information for you: "Atiku’s VISA: Group Takes Protest To American Embassy". Here is the website link: https://headlinenews365.com/atikus-visa-group-takes-protest-to-american-embassy/. Thank you.